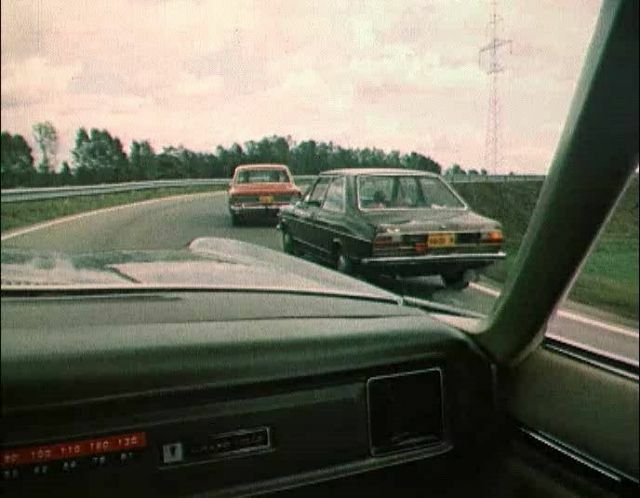 IMCDb.org: 1973 Audi 80 B1 [Typ 80] in "Mirazh, 1983"
Only 1973 due the rounded bumpers. Seems to be GL-trim. When I was a kid, our neighbour, an older unmarried lady, had exactly such a car. A 1973 Audi 80 GL automatic in this brownmetallic with sunroof, green interior and tinted windows. A garage-car in perfect condition, after 14 years it had only 30.000 km on the clock. When she moved, she sold it. I was too young to take it. Five years later I saw it again, driven by the boy-friend of a girl in my school. Totally worn out, damages and buckles all around. Very sad, as it was in such an unique state before. Their fog-lamps are looking awkward like the Belgian-specific ones. If the Audi would have the original VW/Audi fog-lamp (the smaller, nearly square ones were from Hella, the bigger, more brick-stone shaped from Bosch), it would have benn mounted under the bumper and a bit more left.